The Indian state aggressively promotes foreign investment in all sectors but civil society. A contribution to the openGlobalRights debate on Funding for Human Rights. Indian governments have always been fairly paranoid about NGOs, especially those challenging big business or inequitable development projects. Nevertheless, the previous Indian government has consulted with some NGOs and civil society activists on several critical issues. Although the state was indifferent to civil society protests against mines and corruption, it did seek NGO input on major public welfare policies such as the right to information, universal education and food security. Although officials did not always accept NGOs’ advice, the conversation, at least, continued. The new Indian government led by the right-wing Bharatiya Janata Party (BJP), however, engages in very little dialogue with NGOs or people’s movements. This is consistent with the record of BJP-led state governments in Gujarat, Madhya Pradesh and Chhattisgarh. The BJP prefers to talk only with those belonging to their “Parivar”, or family of right-wing associations, including the Rashtriya Swayamsevak Sangh (RSS), an India-wide social movement that is the BJP’s ideological mentor. Within days of BJP leader Narendra Modi becoming the prime minister, someone leaked a top secret report by the federal Intelligence Bureau (IB) to the press. The report briefed Modi on India’s NGOs, expressing anxiety over their foreign funding and opposition to development projects, and accusing them of being “anti-national”. I have seen a copy of the IB report, which identifies the work of specific NGOs. Most of its concerns over foreign funding are based on unverified rumors of misused funds and illegal donations. It also takes issue with some NGOs possessing maps with marked locations of India’s natural resources, and spots designated for future nuclear power plants. Why this map paranoia? With so much information available on the Internet—such as Google Earth, Wikipedia and scores of other websites—what is wrong with Indian NGOs collecting and using this data, not to sell or market, but to protect the interests of communities and individuals? Governments worldwide are opening their economies, sharing information and resources, privatizing the public sector and inviting foreign investors into their countries. The Indian government partners with other nations too. Data is power, but it is no longer sacred. Yet the Indian government wants everyone but dissenting voices to access crucial information. Indian NGOs and the general public must also have the right to question economic policies, suggest alternatives and resist what they see as wrong decisions. This is their democratic right. So long as their resistance is non-violent, it is sanctioned by India’s constitution. However powerful or insecure the government, it cannot take away this right by invoking the spectre of “anti-nationalism”. The IB report mentions corruption and embezzlement among activist groups. If true, this is certainly a matter of concern. But the report offers no analysis or evidence, thus tarnishing all NGOs with the same brush. The distortions are shocking and selectively leaked to the media. The aim, it seems, is to demonize all Indian NGOs as anti-development, and therefore, anti-national. Admittedly, some NGOs exist simply to make money or further dubious agendas. Often, these are run by politicians or political parties, and the government has already blacklisted many of these entities. I do not defend these NGOs. Non-profits must be law-abiding and open to scrutiny. Many Indian activists, in fact, will welcome a comprehensive review of NGO work and their impact on beneficiaries, policy-making, the environment and developmental projects. India’s social sector must be more self-vigilant, and mobilize society to raise domestic funds as far as possible. 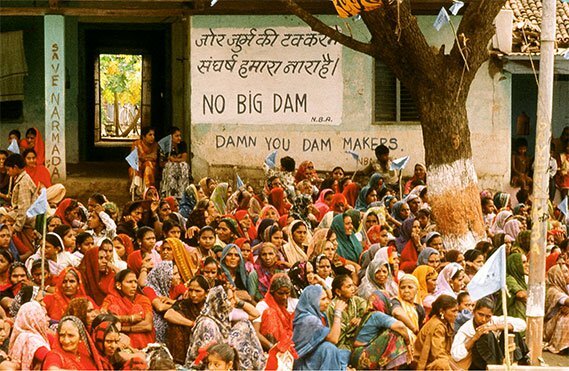 The Narmada Bachao Andolan, to which I belong, does not take funds from abroad. We also did not accept the financial grants that accompany our international awards. However, it’s not easy to survive and do effective work while relying only on volunteers. A sweeping rule against foreign funding would be seriously damaging to Indian civil society. In today’s globalized world, governments themselves use funds from multilateral agencies, including the World Bank, the Asian Development Bank, the International Monetary Fund and bilateral aid agencies. A government that accepts millions of dollars from abroad has no right to question foreign funding of Indian NGOs. Regardless of the funding source, if the work promotes equity, justice and sustainability, and is done in a transparent manner, it should not be questioned or threatened. There are myriad understandings of “development” in a nation such as India, and they often contradict one another. People’s movements stand against the injustice of hasty corporatization, question unruly displacement without rehabilitation, and criticize the unsustainable exploitation of natural resources. They also offer alternatives to technologies in every sector. These are issues for constructive, democratic debate, not brutal state crackdown. When the state sees an NGO opposing their conception of development, they believe it is opposing the state itself. Take for example, the Narmada Bachao Andolan, which fights for the rights of people displaced by large dams and opposes corruption and violation of environmental laws; or the tribes in Orissa, who question the government’s takeover of land for a South Korean conglomerate; and the fisher folks in Tamil Nadu, who protest against the Koodankulam nuclear power plants because of genuine safety concerns. The state crushes all of these, dubbing them as “anti-development NGOs” working against the national interest. But this same government woos foreign capital in crucial sectors such as water, power and education. In a sector as sensitive as defense, the state has done away with any cap on foreign direct investment. Every Indian NGO that criticizes genetically modified foods is targeted, their credentials questioned, and their motives misinterpreted as an opposition to progress and scientific development. Yet, companies like Monsanto, which promotes genetically engineered seeds (with state encouragement) and has been accused of damaging Indian cotton farming, are never held accountable. Only a few of the hundreds of allegations against Monsanto are even investigated. Private companies from abroad fund a significant portion of national development policies, but when Indian NGOs promote equitable alternatives with foreign support, the government suspects political manipulation by “foreign hands”. In reality, the impact of foreign funding for Indian civil society is miniscule compared to that of foreign (and domestic) investor lobbies on issues such as education, water and mining. Investors loot the country’s natural resources aided by growth-hungry legislation that creates sufficient loopholes for companies to bypass people’s legitimate rights and environmental needs. In India, moreover, this kind of private sector lobbying is never an open affair; instead, it involves closed-door dealings, nepotism and corruption. These efforts leave a much larger imprint and cause more damage than foreign aid to NGOs, but very little of their influence is reported or known to the public. The dice in India is loaded in favor of the rapacious corporate sector, both local and foreign, which is invited to destroy our forests and plunder our environment. In return, they get huge profits with tax breaks, cheap land and displaced people. The state regards any attempt to question these plans as “anti-national”. The state is hypocritical; this much is clear. But if the rulers also scuttle debates and strangle people’s voices, aren't they also engaged in fascism?